The toy is covered in soft plush and will make a great gift for young (and old!) pirate fans who love soft quality plush toys. Ages 3-8. 10 inches tall. This is a great toy to comibne with the TOY: CUDDLY PIRATE SHIP and other plush figurines. 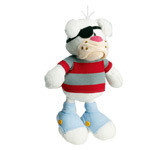 Fun plush pirate toy that is soft and cuddly. Since 1971 plush designs have been a hit in Europe and Asia. Product meets all safety standards in Europe and the United States.